Dr Eline Boelee is an interdisciplinary scientist with 25 years’ experience in the links between water, health and ecosystems. She is a expert on the health and environmental impacts of water resources development; ecology and environmental control of water-related diseases; multiple use water services; water quality; and ecosystem services. In SOPHIE, Eline will contribute to the Innovative Solutions project as well as working on the exploration of Future Scenarios with local stakeholders. 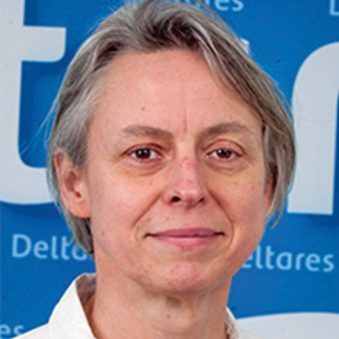 Eline joined Deltares in 2017 following a position at the International Water Management Institute, based in Sri Lanka and Ethiopia. There she led international multidisciplinary research projects on improved planning and management of water resources to enhance health and environmental sustainability in Africa and Asia. Identifying future environmental, social and economic trends and predicting their impact on water and health.